Jeff Betts: I landed an 11 lb clipped Chinook at Border yesterday, a beautiful animal. Putting the head in the freezer, I realised it probably came from a Puget Sound hatchery. Who funds those hatcheries? I should be sending them money....are they publicly funded or volunteer or ?? If Canadians aren't hatching enough springs then why wouldn't grateful fishers here help the Americans scale their already productive operations? A: I got in touch with Gerry Kristianson on this one and he gave me a link and an explanation. Most of you will know that Gerry is one of our sport fishing brains trust guys, head of the Sport Fishing Advisory Board, and a commissioner with the Pacific Salmon Commission (PSC) that sorts out salmon issues between Canada and the USA. His link is good: http://wdfw.wa.gov/hatcheries/overview.html. It has the money spent and the numbers produced. It covers all of Washington State, although it is the Puget Sound hatcheries that pump out our marked hatchery fish. Canada marks few, while in the States high numbers are marked, meaning cut off adipose fin, but no tag. The purpose being to have a take fishery, rather than sort out which is where and where from with tags – much more expensive. So if you send in a head and the results come back as no specific hatchery, it is likely one of the US fish. The purpose is to provide a take fishery, while sending the wild Puget Sound – and BC – wild fish back to their natal river and support those genetic populations. 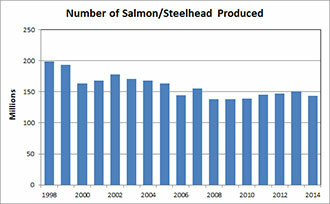 The graph below shows that about 150 million hatchery marked coho, chinook and steelhead are produced each year. The US started down this road when it discovered wild gene populations were being homogenized by hatcheries using mostly one stock and stocking it in multiple rivers. One stock of chinook, known as ‘springers’, was spread far and wide, including in Oregon, and in part lead to the problem along with the Endangered Species Act kicking in as truly wild stocks were nose diving. The other purpose was to stop inter-stock mixing on spawning beds. There are has 128 state, federal, and tribal facilities. These hatcheries produce the majority of all salmon caught in Washington waters. 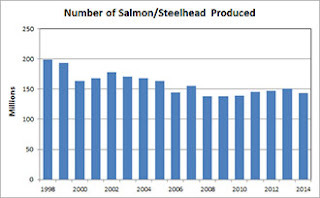 Here are some Puget Sound stats: for coho, in 2003, 5.2 million marked fish were released, and in 2013 it was 4.3 million; for chinook it was 16.7 M and 22.1; steelhead were 6.0 and 5.4. Tagging studies indicate more than 75% of the salmon caught in Puget Sound, are from hatcheries; 90% in the Columbia River; and 88% of all steelhead. The reason we are allowed to keep these US fish is that the PSC allows each country to take some of the other’s fish. As Alaska takes BC fish in its saltwater commercial fishery, we in BC are allowed to take Washington State fish in our sport fishery. This of course applies along the entire BC coast, and many summer stocks are from several USA states. But in Victoria, our fishery for nursing 2- and 3-year old marked chinook is primarily from Puget Sound. It is an authorized fishery. Gerry also mentioned, in the PSC context with Puget Sound hatchery operations, that it has the effect of preserving wild chinook, from both the Sound and BC, for example, the Fraser River chinook. That is another reason why they bought into the concept. Those North and South Nooksack, Samish and other Sound rivers with wild chinook, we have been conserving under the various slot and hatchery stipulations in our retention limits, have contributed materially to wild runs that the USA wants protected. So it has been win win. As for who to donate to, I would suggest that since our take of Puget Sound fish is authorized, you may want to donate to the Pacific Salmon Foundation as it leverages seven times for each dollar donated to enhancement and habitat restoration projects. DFO does fund hatcheries and the annual budget is in the range of $25 million, and it produced 586 Million fry a year, when last I looked at the stats. There are several budget sources for funding hatcheries in Washington, both for operating and infrastructure. It is about $64 Million for operating. In other words, we spend less cash and put out more fish, but I don’t think the two systems are comparable. Our stats include chum, pink and sockeye production. (We need more support for Fraser chinook). There are far fewer hatcheries in BC, and the big infrastructure number in Washington of $1 Billion reflects more hatcheries and older hatcheries. In BC, infrastructure is aging, but it is not yet a public discussion. Finally, when we let go the big wild fish in the summer in Juan de Fuca and Haro, we are supporting Fraser as well as Puget Sound chinook that haven’t yet crossed over to the American side of the watery border. The obvious spot to fish would be Constance Bank, and Border Bank. It may also help explain why the Flats was so hot in May and June last year for mature fish, and it was good to me on my last trip out last week.